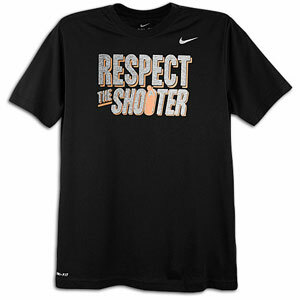 The Nike ‘Respect the Shooter’ T-Shirt is available now in three colorways and you can grab them on Eastbay. Remember folks… leave a shooter open and live with the consequences. That KicksonCourt T is nice though. 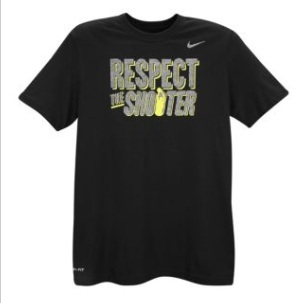 Shame on Nike to promote a t-shirt with such a negative double meaning. 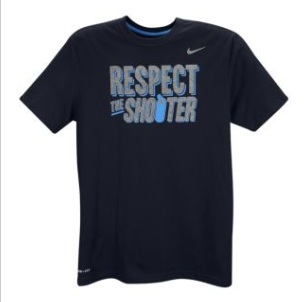 A lot of these kids are in areas where a culture of youth violence glorifies guns and shooting, and this t-shirt sends the wrong message.